Mid-day on March 15: The switching engine was moving left and then stopped, yet the gates remained down. 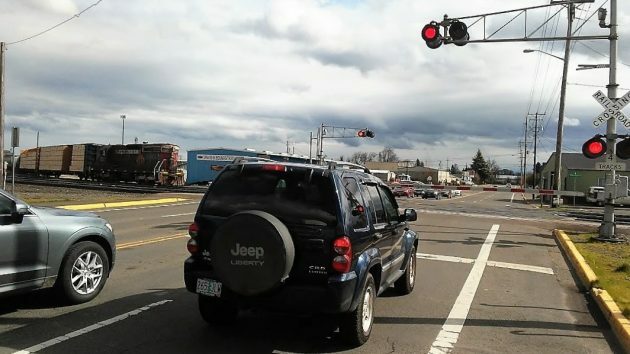 One little change in operations would reduce the number of traffic delays at Albany’s Queen Avenue railroad crossing, and thus cut down on complaints about long waits as well. At least that’s what I’m thinking after watching for a while as the bike and I were standing at the notorious crossing the other day, waiting for the gates to go back up. Notorious? Yes, frequent complaints about long delays on Queen Avenue go back at least to the 1970s and the days of the Southern Pacific. On the day, the Portland & Western switch engine was pushing a number of cars back into the yard to the north of Queen Avenue. It had cleared the crossing and stopped well north of the street. For the couple of minutes the track was free, yet the gates remained down, and traffic remained blocked. Then the engine started south again, crossing the street and continuing some distance before stopping and reversing course, eventually clearing the crossing by 100 yards or so and allowing the gates to go back up and traffic to flow. The change I would advocate: Fix the wiring so that when the crossing is clear and the engine is stopped or going away into the yard, the gates can go up for the couple of minutes it takes before the engine comes back. The queues in both directions on Queen would not get as long, and the waits would be less. Not that simple between the island circuit the train speed prediction circuit and the requirement for the gates to be down 20-30 seconds before train occupies the crossing. If you hadn’t (or couldn’t) anticipate the stop, as you pull up and do stop, that would be the time to actually turn on your music, then pull out your cell phone, and relax. I have found it very-very rare that one could not actually see the “blockage” far enough in advance to detour. Turn on the music???? That is a vintage SD7, very few are left in the wild. Better yet stop the engine and roll down the windows to hear that non-turbocharged EMD 567 prime mover purr. Train Enthusiasts from all over North America (and the world) head to that crossing to see 1501 strut her stuff. Hardly enough room for a run up ramp for a bridge or an underpass.? The locomotive probably just needed just a few more feet to clear the crossing circuit but often that distance is just not possible. And, it takes about 10 – 12 seconds (I know, it doesn’t sound like much) for the crossing’s electronics to recognize that the locomotive has cleared the circuit.